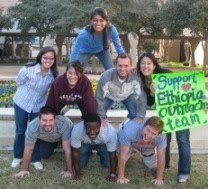 Ethiopia 2010: What is UTHSCSA Ethiopia Outreach? The Ethiopia Outreach team travels to rural parts of Ethiopia for 3-4 weeks each summer to provide free medical service to underprivileged populations. We are developing a relationship with Common River, an NGO in Aleta Wondo, to make sure our efforts contribute to a sustainable cause—preventative medicine and care throughout the year. To do this, we’ve chosen to work alongside the government clinic, which is tasked with supporting this region of 30,000+ people with little medicine, deficient equipment and zero physicians at their disposal. With the help of Common River, our team hopes to improve this clinic's resources and the health of this growing population over the next several years.